The Maui Platinum 4 berth motorhome can sleep up to 4 people – it’s also perfect for a couple seeking extra space and style. For pick up and drop off Brisbane, Sydney and Melbourne Maui branches. 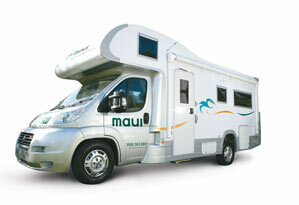 These details are indicative of the motorhome that will be supplied under your booking. Actual motorhomes may vary according to year of manufacture and availability but your vehicle will be suitable for the required number of persons and have equivalent or better specifications to those listed in this website. Baby seats (3 years & under) and booster seats (minimum 4 years of age) can be fitted on the rear seats in the dinette area, facing forward.